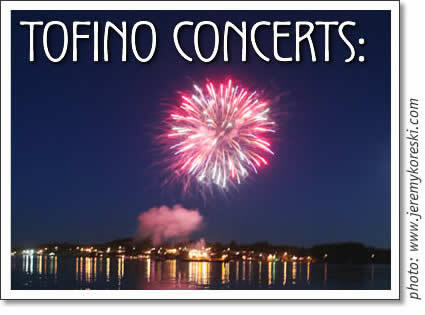 The following concerts are happening in Tofino in the month of August 2006. Tickets are available at Tofitian, Esso and at the Common Loaf. Mexico City has been skanking to the cool- mestizo- reggae rhythms of the Rastrillos since 1988, grooving to their joys and pains, following their musical quest for basic human values--friendship, respect and love. Rastrillos music is a fusion of mexican popular music, with the root of reggae mixed with a taste of the jazz, funk, indu and ska traditional. The Rastrillos' songs talk about all they have experienced during this long voyage guided by the four winds. D.O.A. show a return to their punk rock roots that all got going back in the late '70s. Their style incorporates rock'n'roll, metal and a little ska/reggae. They have battled police, rip-off promoters, rip-off record companies and red necks, to make their way through over 3000 shows, 10 studio albums and endless tours throughout North America, Europe and Australia. Known for their legendary performances and 'give it all' attitude these boys are coming up to get a taste of the Tofino Mosh Pit-show'em what ya got Tuff City!! Both Murge and Verse have been deejaying together for 7 years, from their residency at Victoria's hottest club night stirfry (r.i.p.) to packed dance floors across the country. Their style is aggressive, yet smooth, constantly maintaining their entertaining turntablism. If you want to dance, come on down and see them! Tofino concert listings for August 2006 from Tofino TIme Magazine.